An archaeologist hopes to gain new insights into the life of a young woman who died more than 3,700 years ago. The woman's bones, including a skull and teeth, were discovered at Achavanich in Caithness in 1987. Unusually, she was buried in a pit dug into solid rock and her skull is an abnormal shape which some suggest was done deliberately using bindings. 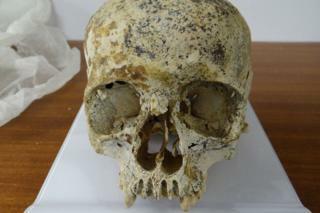 Maya Hoole believes advances in technology could reveal more about the remains known as "Ava". Since the discovery and archaeological dig almost 30 years ago, plans of the site that were drawn by local authority archaeologists have been lost. Ms Hoole believes Ava's story has become largely forgotten. The archaeologist has set up a website dedicated to new research on the bones, a decorated beaker buried with the woman and the Middle Bronze Age burial site, which lies close to the A9 between Latheron and Thurso. Tests already done on the remains suggest the woman was aged 18 to 22 when she died. She was buried in an unmarked rock-cut pit rather than underneath a cairn or in a pit dug into soil, which are the most commonly discovered burial sites from the Bronze Age. Ms Hoole said she was only aware of a handful of other pits dug into solid rock that have been found in Scotland. She said: "A lot of time and energy was invested in this burial. "It just makes you wonder - why go to all that effort? What was so unique about the individual buried here to receive such special treatment?" The decoration on the beaker found with Ava appears to be unique, the archaeologist said. She said: "I've looked far and wide for comparable examples, but there's nothing else out there quite like it, again making this burial significant. "I have closely examined the beaker decoration and discovered that at least three different tools were used to create the design, likely meaning that the artist had a specially-made tool kit and was prepared and likely experienced." Ms Hoole added: "Like many others, I'm sure, I find skeletal remains completely mesmerising. "The evidence shows that this was a young female, aged between 18 and 22, but we have no evidence of cause of death. Since she was discovered in the 1980s we have made great advances in technology and it makes you wonder what we could still learn from her. I've been working on recreating the lost site plans, and interpreting the position this individual was buried in. "My interpretation suggests that the layout of the burial fits into a much wider trend extending as far south as North Yorkshire, and possibly much further beyond." What is known about Ava is that she was part of a much wider European group known as the Beaker people. Short and round skull shapes were common amongst this group, but Ms Hoole said the Achavanich specimen is exaggerated and of an abnormal, uneven shape. The archaeologist said: "There has been much debate amongst the archaeological community for many decades about the shape. Some argue it is a hereditary trait, whilst others think there may have been a practice of head-binding which creates the distinct shape. "Perhaps this site can contribute more to the debate if further research is undertaken." She added: "She has been fondly nicknamed 'Ava', an abbreviation of the place she was found. "Although potentially a controversial decision, I want people to remember that this is not just a cluster of bones, but that she was once a human being, with a name, an identity and a place in a long lost community."